Home Uncategories Do you know Derek Hill? You should. Do you know Derek Hill? You should. Editor's note: this post makes use of the standard 20/80 scouting scale, so here's the skinny -- 50 is average, 60 is above average, 70 is "plus-plus," and 80 is flat-out elite. Going the other direction, 40 is below average, and anything below 40 is too embarrassing to talk about. Cool? Cool. 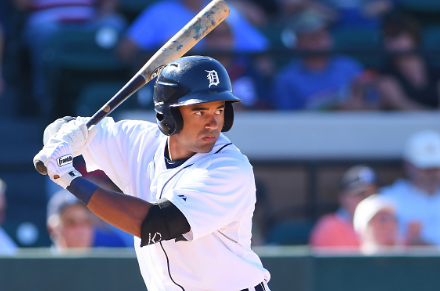 There was a lot of buzz around Derek Hill when he first got drafted by the Tigers in 2014. They hadn't spent a first-round pick on an outfielder since Cameron Maybin in 2005, and the normally pitcher-obsessed front office hadn't picked a position player in the first round since Nick Castellanos in 2010. Beyond that, he was a kid fresh out of high school. He's young enough that, when The People v. O. J. Simpson aired earlier this year, you probably could have spoiled the ending for him. Barely done with senior year biology exams, and he's already a top pick to play center field for the Tigers organization? How could there not be some buzz? Hill made it to West Michigan last year, and I was eager to see if the hype was warranted. Unfortunately, 2015 was kind of a jerk to Derek Hill. He played two games to start the year and suffered a quadriceps strain that put him out of action for nearly two weeks. He played through the month of May and into the first two weeks of June, and then the old injury flared up again, putting him back on the disabled list for another two weeks. He returned on July 1, played in seven games, then went right back to the disabled list -- he didn't play again in 2015. What I saw in the brief time that he played during 2015 was a very good defensive center fielder with blazing speed and a decent arm, but also someone who often looked overmatched at the plate. He swung at pitches out of the zone, he made weak contact, and in the month of May (the longest sustained stretch of play for him that season) he only slashed .218/.279/.250. Oh well, glove first, right? Oh, and the speed, of course. That beautiful, blinding speed -- easily an 80 on the scale -- that somehow netted him 25 stolen bases in just 53 games. I had him clocked somewhere between 3.4 and 3.6 seconds from home to first base, and from home to third base on a triple in under 11 seconds. That's ridiculous. Fortunately, 2016 has been much more kind to Hill, and he's been a pleasure to watch. He knows the outfield, and he covers a lot of ground very quickly. He robs potential in-the-gap extra-base hits regularly, sometimes because he just plain outruns the ball, at other times because he's not afraid to lay himself out and dive. This defense is easily 60-grade, if not 70, and it's going to win him multiple Gold Glove Awards in the future. He's also improved at the plate this season. His approach is better, his pitch recognition is better, and he's making more solid contact. He absolutely raked in the month of June, slashing .327/.372/.452 -- the elevated slugging percentage points to a bit more extra-base power that month, as the wiry 20-year-old smacked six doubles, two triples, and one home run. The power is probably a bit below average, a 40 on the scale, but he'll get it to 50 soon enough as his body fills out a bit more. He's never going to be a 25-home-runs-per-year guy, but he could certainly have good years where he sees 10-12 long balls. For now, he racks up doubles and triples by shooting the ball down the lines, or three-hopping them into the gaps -- which he does on both sides of the field. His on-base percentage is up this year (currently at .313), but his 6 percent walk rate could use some improvement (MLB average is closer to 8 percent). The more he can get on base, the more he can beat other teams with his legs. With that elite speed, a walk is almost an automatic double -- or even a triple. When Hill gets on base, everybody in the ballpark knows he's stealing, and they still can't stop him. What could the Detroit Tigers do with a Gold Glove center fielder who hits .250 to .260 and poses a constant threat on the bases? With Anthony Gose quickly going down in flames, and Cameron Maybin coming off the books after 2017, the organization would be smart to hang onto Hill and keep cultivating him as their Center Fielder of the Future.